On a pleasant January afternoon, fourteen Pi members and a brand new one, Beverly Wright, showed up to what is becoming a popular meeting. There were many of the usual faces and some new ones too — Nancy Sefarian and Jim Lieberman come to mind. Due to an extensive inventory project being conducted by several Reclamation Program volunteers, we moved the SIG meeting about ten feet north into our landlord’s adjoining conference room. The large room and extra space was nice, and it offered a chance to expand this meeting as well as lay the groundwork for other Pi meeting opportunities. A goodly crowd was on hand for the January Retired SIG meeting. At this meeting our agenda was to “show and tell “about our Mac-related holiday gifts. However, before we could begin with the presentations, a question-and-answer session about Mac OS X began. 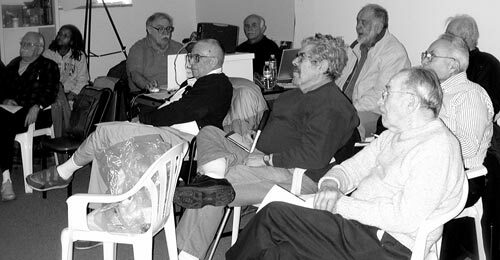 Only a few of those present reported getting any new toys of this type during the holiday season, so Len Adler showed, via PowerPoint slides and a live demonstration, how he intends to use his new iPod to be the DJ (disc jockey) for his 50th high school reunion. His iPod is loaded with hundreds of songs, and it will provide the background music for the event. It seems simple to pair the iPod with any external amplifier and then fill a room with music. Several members of this SIG have admitted to owning iPods. Perhaps they too will venture into the role of DJ at a future celebration where music is involved. Oh, how Frank Sinatra and Rosemary Clooney refresh the older generation with their crooning! 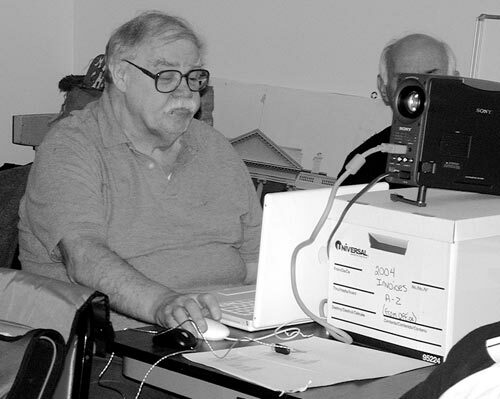 John Barnes guides the Retired SIG through some of the features of Mac OS X, assisted by a compact Sony video projector. After this, John Barnes took center stage and presented tips on how to put certain familiar parts of Mac OS X to full use. Features such as Smart Folders, Smart Mailboxes and the Sidebar — that’s the left side of a Finder window —were demonstrated in detail. We also watched what could be done with “Mighty Mouse,” Apple’s latest version of the mouse, which has two click pads and a scroll ball. During the informal presentation, there was one important comment by John that bears mentioning: Mac OS X, unlike Mac OS 9 and its predecessors, has certain sections that should not to be tinkered with; it would better if they were hidden because they hold and run important system files. Also, we left knowing more about that mysterious "Home Folder" Library folder too. Overall, John was helpful in unlocking some of the secret workings of Mac OS X. It doesn’t appear nearly as ominous now. John ended the program with an open question: “What program opens Word documents and is a great word processor that you may have overlooked?“ The answer, TextEdit! The next meeting of the Retired SIG (you really don’t have to be retired to attend) will be on the customary fourth Thursday, February 22. See everyone there!